Camping (campshaw style) isn’t all glamour. Breakfast today is Wheat Thins & peanut butter, along with about three pots of Schuil Coffee Northwest Blend (our favorite). We’re gathering our energy for a day exploring San Antonio by bike. 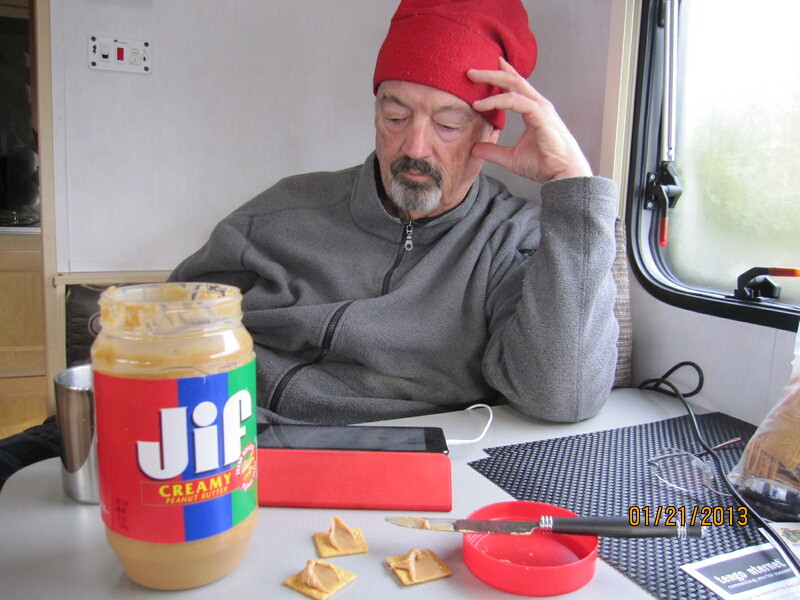 This entry was posted in RV life, simple camping, T@DA and tagged camping, RV life, T@DA by Judy Crankshaw. Bookmark the permalink. That’s quite the fall in food quality since our days eating at Zingerman’s. But at least you have San Antonio to explore! Have a blast. There’s so many cools things to do in San Antonio. I recommend the Alamo, the zoo, the River Walk, and the Hispanic district. Those were my favorites. We got in a bit of cycling today, the River Walk path extends all the way south to our campground – five miles or so from the city. Spent a lot of time at the Alamo, Riverwalk, and a couple of the Missions. BBQ, bike, beer…..all good. Hope you are surviving what appears to be extreme cold! We didn’t get there today – spent a lot of time at the Alamo, wandering around downtown, then a couple of the historic mission sites. We’re headed out tomorrow. Would very much like to come back to San Antonio again – there sure is alot to see around here. Why do I feel so rushed??? Jiff Creamy is for old men with no teeth!! where is that crunchy PB ? ?